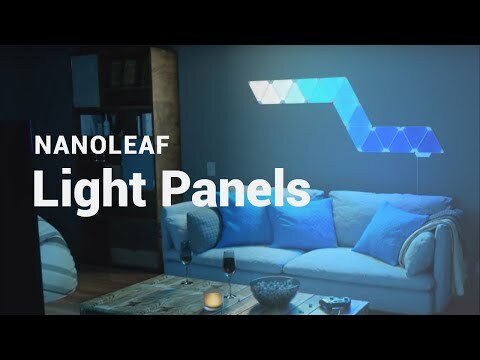 Introducing the Nanoleaf Light Panels, an all-new smart lighting product designed to help you light up your life your way. The modular Light Panels can bathe you in as many colours as there are people in New York City. They can also recreate the perfect white light for your needs—sunrise, rainy day, brilliant daylight, or anything in between. It’s the perfect lighting product for those who love design, for those who want to improve their quality of life, and for those who just want to add some fun and excitement to their living space. Features • Modular panels snap together like LEGO pieces. • Apple Homekit, Amazon Alexa & Google Assistant Certified, Apps for iOS & Android. • Colour changing (16.7M colours) and tuneable white. • Simple ‘no holes, no hassle’ installation. • WiFi control, no hub or bridge needed.